"New" CR250. Fixing it up for Spring. I got this a week before Thanksgiving but haven't had a chance to ride it yet. It's a 2003 CR250. I traded it for my 2008 KX450F plus I got $700 cash. The rear tire was worn out so I took it to a shop to have it changed, they informed me that the wheel was cracked. I bought a black Tusk Impact wheel with black spokes and a new tire...a Bridgestone but I can't remember the model. They laced it up for me with the stock hub and I really like the look. I will do the front wheel later when I have some spare cash. My old bike had the number 229 on the side panels and front plate so I wanted that again. I emailed Rocky Mountain and asked if they could do the numbers in reverse and they got back to me and said they could. So I have weird looking reverse numbers. I went and got the title switched to my name and registered it yesterday. I am just waiting for it to warm up so I can ride this thing. Looking nice! I think you need to swap the front wheel to match the rear for aesthetic reasons Looks to be a pretty well cared for, low hour bike? Yeah, am going to get the wheel swapped later this summer. I have it on the docket. I don't know the history of the bike but I do know that the guy I got it from was very knowledgeable and was an older guy so I figured it was in better hands than a clueless 14 year old. That looks really clean. Nice pick up indeed. Hey Woody, What's up? I never see you guys. Are you going to ride this summer? Nice bike! I like the pipe. I know. Now that I live in Utah County we really should have you guys over for some foods. Riding... I would love to, but I lost my good job and had to sell all the bikes. I'm back in school too so time is shorter than I would prefer for fun. 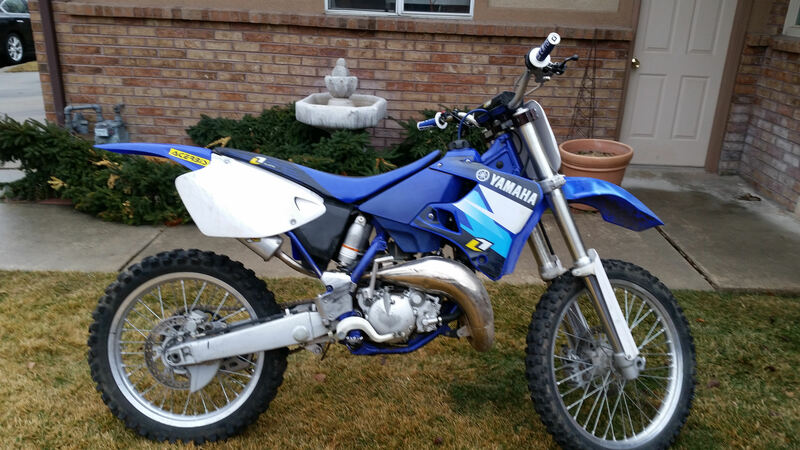 I also have a 2001 YZ250 that I am fixing up. You can ride that. Oh come on cowboy. We owned a YZ125 for a while and I LOVED that bike. The one YZ250 I rode I did not love. The 125 on the other hand was a blast. I'll ride the 125! Similar Threads for: "New" CR250. Fixing it up for Spring.